TEACHER, HOW IS THE NEW YEAR GOING SO FAR? 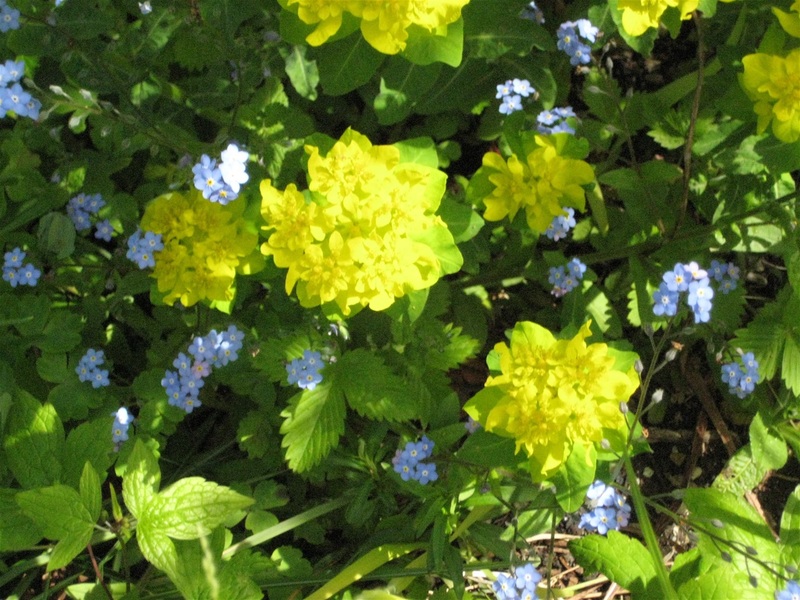 My photograph of acid yellow euphorbia dotted through with forget-me-nots, from the garden. HELLO TEACHER! HOW'S IT GOING SO FAR? When Everyone Needs Calming Down! HELLO TEACHER! Are You Looking After Yourself, Ready for the Year End Approaching? As a teacher, you have to look after yourself, and especially your health, both physical and mental. Always avoid lifting or shifting heavy furniture, or any other such items. That is someone else’s job. Find out who that person is as soon as possible at the beginning of the school year, and introduce yourself to him or her. A teacher CANNOT have a bad back! COLDS and infections are inevitable ~ you shall be picking up all the new common cold viruses, all year, as brought to school by the students and other staff. Make sure you eat a diet rich in fruit and vegetables, drink lots of water, including especially foods that boost your immune system (see Section below). DEHYDRATION can slow mucus production, which makes it harder to clear viruses. This happens more in Summer and also in hot, airless, classrooms in the colder months. Sip plenty of water throughout the day. Check with the School Rules to ascertain if your students are allowed to drink water from unspillable bottles or cups during class. WASH your hands regularly and properly. Most colds are passed on when you touch the hand of an infected person, or a surface contaminated with the cold virus, and then touch your eyes or nose, transmitting the infection to yourself. Therefore, if you wash your hands regularly and thoroughly throughout the day, you cut your risk of infecting yourself. Please reinforce the 'hand washing' message with students, and EXPLAIN the benefits. SLEEP ~ Getting eight to nine hours sustained sleep a night helps maintain your immune system and prevents you catching a cold. But it’s not just going to bed on time that counts; you need good quality, sustained, sleep. Please see my Post on 'Beware the Light!!' and the deleterious effects of late night and / or long-term use of electronic devices emitting the blue-violet light spectrum ~ televisions, laptops, iPads, Kindles, Tablets, mobile phones, no matter how small the screen. The evidence is mounting on the lack of attainment and failure to achieve expected results for students, and everyone in the workplace. Please tell your students WHY they need nine to ten hours sustained sleep nightly. For your young Students, let them know they grow during sleep, and their bones continue to develop. It is understood that 90 per cent of bone growth takes place at night. Nine to ten hours of good quality, sustained, sleep give a child, youngster, and teenager adequate rest. The human growth hormone is released during this time, resulting in growth spurts. Sleep is essential for the body to rest, and adequate rest means better physical growth. Youngsters would be fascinated to know how much they grow in their sleep ~ SUGGEST to your students that they need to take control of their sleep, as surely they want to grow as much as possible. and information processing, as well as many other systems of the brain and the body. The older your students, the more they may be interested in the science of sleep, and it could make an interesting Project-Based Learning (PBL) undertaking, with different sections of the class dealing with discrete elements of the benefits of sleep. Sufficient Magnesium in the diet is essential to help gain and maintain good quality sleep. If you have difficulties getting to sleep and staying asleep, you may wish to consider taking a Magnesium supplement. Please discuss this with your GP. There are high potency, much improved uptake Magnesium supplements which are of great benefit to those of us who have difficulty absorbing Magnesium from our normal diet. Some people CANNOT absorb Magnesium from their food. Epsom salts baths may be necessary at times. As the school year continues to progress, self-care becomes even more important, because the examination and / or assessment requirements are building. TRY NOT TO SLIP from your daily habits of good food, lots of water, plenty of sleep, and a reasonable exercise regime ~ you're not trying out for the Olympics! CONSIDER having an annual Influenza Vaccination. I know some people disapprove of this. However, you are not just considering your own health, you have to consider your wider family, including older people, pregnant women, and members who may be frail, and who would find fighting influenza problematical. Antibiotics are useless against influenza or any viral infection. Visit hse.ie/antibiotics for further information on when antibiotics may be required, and when they have no benefit. "the World Health Organisation warned cases in Europe have jumped by up to 50% in the first five months of the year due to low uptake of the vaccination". There is a requirement of 95% vaccination cover to give a 'herd immunity' required to stop the disease from spreading. The Health Service Executive (HSE), which is the National body in Ireland governing the Country's health care, has an Integrated Care Group for Children, and Dr Kevin Kelleher is on its Steering Group, and is also Assistant National Director for Public and Child Health. Dr Kelleher was interviewed on the subject of outbreaks in parts of North Dublin and an adjacent County. This is because around 8% of babies nationally do not get the vaccination, and 13-15% of babies are not vaccinated in North Dublin. There is no reason to think this profile is not replicated all over the 'Developed World'. Measles had previously been almost completely eradicated in the 'Developed World' according to the programme. Dr Kelleher was asked why there was not full uptake of the vaccination (it is free in Ireland), he said that there is "a very stubborn group of people who are very anti-vaccination" and "who put out stories" via the internet, media, social media, which put people off having their children vaccinated. Dr Kelleher told of of his experience of treating babies with measles when he was a young doctor, and ended by stating the following vehemently. "Let nobody ever think measles is a mild disease. IT IS NOT." He mentioned the group of people in the population who have not been vaccinated, especially in the "nadir" years 2001 / 2002. People who do not have their babies vaccinated at 12 months as part of the MMR, and the booster vaccination when they start school, are not just risking the health and possibly the life of their babies, but they risk the health and welfare of all who come in contact with their babies and children. Do you know for certain if you were vaccinated as a child? The age group of approximately 40-35 years and younger, is more likely NOT to have been vaccinated due to the unsubstantiated scare over the three-in-one vaccination causing autism, during that period. The MMR vaccine (Measles, Mumps, Rubella), can be TAKEN AT ANY AGE if a GP immunity test shows you have no immunity. (Visit www.immunisation.ie / www.hspc.ie). The 6-in-1 vaccine protects a baby against six diseases: diphtheria; hepatitis B; haemophilus influenzae type B (Hib); polio; tetanus and whooping cough. Visit the above mentioned links for further information. And The Answers to Them"
by Dr Ramesh Manocha, can be found at the end of this Post. Of course, your health is very important, but so is that of your students, family, older or frail people in your life, most especially pregnant women, and any women you know who may be planning a pregnancy. Catching RUBELLA in early pregnancy carries a risk of miscarriage. Nine out of ten babies WILL HAVE major birth defects such as deafness, blindness, brain damage, or heart disease. The first signs of German Measles are a high temperature and a sniffy nose ~ just like the common cold. In fact, some have no symptoms at all. By the time the telltale red splodges appear, two to three days in, you have already infected others. Proximity is enough to infect another, so being in the same room is sufficient to pick up or spread the infection. If you feel you have the sniffles, do not go out. PLEASE visit your GP to discuss this and other matters that affect teachers in particular. Please take time to visit www.immunisation.ie for further very important information on immunisation in general. Pregnant women may need to learn about getting the WHOOPING COUGH (pertussis) vaccination while pregnant to protect the foetus in the womb and during the first few months of life. PERTUSSIS is a highly contagious disease that can be life threatening and is most serious in children less than six months of age ~ possibly resulting in hospitalisation for pneumonia and brain damage. PLEASE see your GP if you are pregnant, hoping to be pregnant, or working in an environment with women of child bearing years, for their sake and for your own. PLEASE MEET YOUR GP FOR ADVICE ON DECISIONS REGARDING VACCINATIONS, IMMUNISATIONS, AND ANY POSSIBLY REQUIRED SUPPLEMENTS TO YOUR DIET. Having considered the matter of vaccination and the possible consequences of contracting any of the illnesses contained by the MMR vaccine (Measles, Mumps, Rubella), plus the duty of care any school or educational establishment has to its employees and students, I have come to believe it is reasonable for an interview board to ask any potential employee, at interview, if he or she knows if he or she has had the MMR vaccine. Some people do not know if they had this three-in-one vaccine at a very young age, but a GP immunity test can show if a person has no immunity. If a potential employee does not know if he or she has been vaccinated, or knows he or she is not vaccinated, I believe it is the duty of a educational establishment to indicate they WILL EMPLOY STAFF who have been vaccinated with the MMR vaccine. An adult can have the vaccine from a GP very easily. Whatever is the personal choice of someone regarding having or not having the MMR vaccine, I have come to believe the COMMON WELFARE of all the staff and students, and their families, in a early education school / Montessori / kindergarten, junior and secondary school, college or university, MUST OUTWEIGH a personal choice not to be checked for an immunity test, or not vaccinated, if shown not to have been vaccinated. I consider no-one can reasonably expect to be employed in a place of work, particularly full of women of child-bearing years, plus female students without having had the MMR vaccine and, of course, their partners and offspring of male teachers. We each have a societal duty. This is just the front line of infection defence. The infection could easily be brought home to the family by anyone working in or attending the educational establishment. You may feel, as a new teacher, that you have to volunteer for everything, to show you are enthusiastic and keen to be involved in the School life. KEEP YOUR HAND DOWN! and only volunteer for something you know you are good at and enjoy, and that your efforts would be making a worthwhile contribution, plus attracting positive reactions from colleagues, school authorities, pupils, and parents. You will spend considerably more time in research, preparation, lesson-planning, and checking homework, than the school hours allow. You will be roped into jobs in any case. Do not rush to add to your workload! Stress is VERY high on the list of teachers' illnesses. However, stress is frequently under-reported, as it is seen by many, FOOLISHLY, as a weakness! Please see the following links. (www.aware.ie/10+ways+to+relieve+stress / www.heartfulness.ie/Anxiety/Relaxation / https://www.extension.umn.edu/...stress/four-strategies-for-preventing-or-reducing-stress). If your whole evening and every weekend end up being spent on grading or preparation, your job has run away with you, and you need to get back in charge. Please see my Post, 'Beware the Light!!' on how over-working with a computer screen, especially late in the evening, can harm your health, and effect negatively your sleep patterns. I know teachers who have had complete nervous and physical breakdowns DUE TO THE STRESS of keeping up with grading homework, preparing new and interesting ways of getting across the syllabus, and possibly studying to improve their own skills. IT CAN HAPPEN to anyone very fast, and it is a long and exhausting way back to health, when one has eventually realised the fact it HAS happened. When you feel out of control ~ YOU NEED HELP IMMEDIATELY! GETTING HELP immediately could be what saves your career. A likely outcome for a teacher who has a complete physical and nervous breakdown is early retirement. In a survey carried out in Scotland at the beginning of February 2017, by Jenny Harvey, a Fife special needs teacher (who was taken aback by the volume of responses – 778 at the last count), found nearly half of teachers are struggling with mental health issues. NEARLY HALF of respondents to the poll on teacher well-being said their mental health was POOR, fuelling fears that growing numbers are struggling to cope with the profession’s changing demands. Experts are saying every school in Scotland should have a counsellor to help deal with teaching's unique demands. A significant proportion also takes medication because of the job. The convener of a national mental health helpline has said that the demands of teaching are so exceptional that a counsellor should be stationed in every school. Some 45 per cent said that their mental health was “poor” or “very poor”, and 15 per cent reported taking medication because of the stresses of their work. Ms Harvey was surprised by some findings ~ such as almost every respondent felt the “heavy burden” of GUILT about the educational experience they offered pupils. “We just want the best for our pupils and sometimes we feel more could be done for them,” she said. “There just aren’t enough hours in the day or resources that we need”. I do not imagine Scotland is out of step, and that the teachers there are under a significantly greater burden than teachers here, elsewhere in Europe, or further afield. I imagine the respondents to this survey found being able to be straightforward about their experience a relief. IS THIS not a good time to ask some stark questions about the general mental health status of our teachers, the levels of support they get to do their jobs, and if they have sufficient resources and assistance to ease their stress levels? ALSO bear in mind, that if your students are sitting a State exam, or any important school exam, some may become very stressed. Prepare from the BEGINNING of the school year to reduce their stress levels by introducing them to the self-help information below with STRESS CHATS. Stressed students can add to a teacher's sense of pressure. If your School has a Counsellor, co-ordinate your Stress Chats with your students with him or her, so that he or she knows to expects extra appointments, and request in good time quantities of leaflets beforehand, from the Counsellor, which you can pass around in the classroom, having read the contents yourself. Then, put aside time to talk to your students about STRESS, impressing on them it is NOT shameful, that it IS manageable, and TO TALK ABOUT IT. Let them know the School Counsellor is expecting applications for appointments. Let your students know you are always there to listen, if they need to talk. If you know the latest thinking on any subject, you will be more confident supporting your students. Clearly, most of the the above sites are Irish, but they should give you basic information, and you could then go to your local Health Authority to obtain links and brochures relevant to where you live. The following may help your students keep a balance, and perhaps you would care to post it up on the classroom wall. A Quote from an Article by Marie Louise McConville on Stress Coming up to Exam Time. The School Counsellor may be pleased to have a copy. "If you are about to sit exams these coming weeks, take a minute to remember that while results are important, they are not the be-all-and-end-all. "Exams can be re-sat but we only have one chance at life and living it and enjoying it and really, without our health, what chance do we have? "So, if you're about to enter that intimidating exam hall or about to hand in that all-important dissertation, take a deep breath and remember, your life will not be determined by this one exam or in this one moment. "If you're feeling under pressure, it's important you talk to someone. You are not alone. Your family and friends love you and want what's best for you and will support you no matter what and you will never disappoint them. "They want you healthy and happy. "Remember, it is true what they say, you're health really is your wealth. Help in the classroom by doing some of the exercises in When Everyone Needs to Calm Down! ~ is to be found at the end of this Post, and also read through with the students the last section called WHEN ENOUGH IS ENOUGH! My Post, 'THE STUDENT TAKES THE LEAD DESIGNING WORK PLANS', helps students to calm down and get some structure to their late evening activities, and plan their own work schedules. Also, use suggestions from the Care for Your General Health ... advice Sections above and below, from the beginning of the school year. For the teacher's own sake, she should have her plans for the examination academic year prepared well in advance, so that the vital work is covered by the students in the fashion that suits them best. Many teachers may have worked with the class the previous year, and so will know what style of studying works for each student. Project-Based Learning (PBL) is a great way to engage learning of all different modalities: visual, auditory, kinaesthetic, and tactile. Utilising PBL is an equitable way to reach and engage all learners in your classroom, and provide them with hands-on, real life, problem solving opportunities. IF SUCH prepared plans are not in place, the teacher can divide the class into the above groups, and get them to work together towards a single goal, for each element of the syllabus. 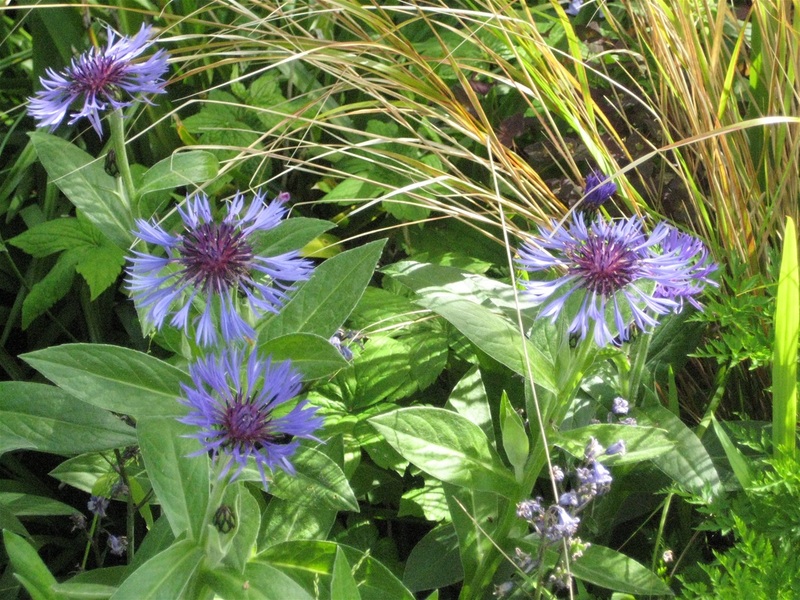 My photograph of stipa gigantica leaning over the cornflowers in the garden. Some people require the addition of vitamins and other substances in food supplements. These can be fairly inexpensive to very expensive and could make a difference, even starting today, to how you manage your resistance to infection, supporting energy and sleep levels, during the pre-exam and exam seasons, any time of stress, or just as part of your regular regime. If you are buying folic acid tablets, for example, buy Folic Acid BP ~ much cheaper than branded versions. Always ask for a generic brand of any supplement or vitamin you choose to buy, and as with every product, check the contents to see what percentage of what you want is included, and what percentage is filler. See below for folic acid rich foods. GARLIC ~ Research has found that people who eat fresh garlic are two-thirds less likely to catch a cold. This is because it contains allicin, which fights infection. Odour-free garlic products are available; I do not know if they are equally beneficial. The potent sulphur compound in garlic, allicin, is responsible for the anti-inflammatory activity of this plant. You can increase the activity of allicin by letting garlic sit for about 10 minutes after crushing or chopping it before adding to ingredients or heating it. Add the garlic towards the end of cooking to retain nutrients. MUSHROOMS ~ Many modern medicines come from fungal extracts. Mushrooms contain Vitamin D, and are great at combating viruses. They are also a handy source of Vitamin B12, an essential Vitamin which helps with mending cells and with eye care, especially in relation to the maintenance of the essential eye mucous. Vitamin B12, other than in mushrooms, is difficult to source in food. Without sufficient Vitamin D your body’s T-cells lie dormant, and these are what help fight infections. Ordinary white button mushrooms, brown caps, large flats, or breakfast mushrooms, are all good sources of Vitamin B12. Don't imagine you need to spend a lot on special, expensive, mushrooms for your Vitamin B12 requirements. Mushrooms also have powerful bioactive components that reduce inflammation. Try a stir-fried mushroom dish, and include other mushroom varieties such as maitake, enoki, and oyster mushrooms. Recent research has shown the many health benefits of Maitake mushrooms, including their ability to boost the immune system. This is due to maitake’s beta glucan content. Beta glucane is a complex sugar that activates and increases the activity of the immune system to help the body fight illness more quickly and efficiently. Studies show that beta glucan may also trigger cancer fighting cells, possibly making chemotherapy more effective. In addition, maitake mushrooms have been SHOWN to decrease the negative side effects of anti-cancer drugs, including nausea, vomiting, and hair loss, when consumed during treatment. Enoki mushrooms have a somewhat sweet flavour, and are frequently used in soups and dishes like nabe and sukiyaki. Similar to the shiitake mushroom, enoki mushrooms are low calorie, low fat, and sugar free. In addition, like other mushrooms, enoki is high in B Vitamins; it’s particularly rich in niacin, which helps support adrenal functions and is necessary for metabolism. In a single cup serving, enoki mushrooms offer 23% of the daily recommended value of niacin. This can help reduce the potential for heart disease and may be useful in preventing second heart attacks in those who are at risk. The Eryngii (King Oyster) mushroom is the largest species of the oyster mushrooms. It has a thick white stem and a meaty texture and can be thickly sliced and grilled like steak. Eryngii has naturally occurring antioxidants, including the amino acid ergothioneine, which protects the body’s cells against free radicals (harmful damaged cells), thus reducing the risk of chronic disease. Ergothioneine, an antioxidant found in eryngii mushrooms, is not reduced by cooking. Eryngii also contain a disease fighting compound called Lovastatin, which helps clear cholesterol from the body’s circulatory system, improving blood flow. They also contain significant amounts of zinc, iron, potassium, phosphorus, and folic acid. They're an excellent source of the essential mineral selenium, and easier to absorb than the inorganic selenium typically found in dietary supplements. GRAPES ~ Grapes have one of the highest antioxidant levels of all fruit. 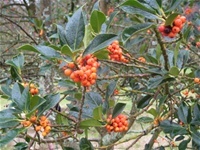 These antioxidants are largely concentrated in the skin. Anti-inflammatory properties of grape skin have been demonstrated. Grapes have also shown to have anti-microbial, anti-cancer, and anti-allergic activity. Freeze them and use them in place of ice cubes. Add them to all your salads. Add them in the last few minutes of cooking to any sauce for sweet bursts of flavour. CARE FOR YOUR EYES ~ Consider the length of time you will be reading texts and reading your screens, your eyes need all the support they can get. Please see my Post, 'Beware the Light!!' for further information on eye care. CINNAMON ~ A generous sprinkle of cinnamon will help expel toxins from the body. It is antiviral, antibacterial and anti-fungal: A TRIPLE SHIELD against illness. Some people cannot bear the taste of cinnamon, so try adding a couple of spoonfuls regularly to curries or to robust, well-flavoured casseroles full of herbs and vegetables, or other strong tasting dishes. It's great stirred into porridge. FOLIC ACID ~ Spinach is rich in folic acid, a key ingredient for repairing cells, this SUPER-FOOD is also a great source of Potassium and Vitamin C, which help keep you healthy. Kale, and other cruciferous vegetables should be consumed at least five times a week because they are rich in sulphoraphane, which helps eliminate harmful toxic compounds in the body that might otherwise promote inflammation. Kale stands out among this stellar group, because it is one of the most nutritionally dense foods on the planet. Try kale in salads, smoothies, soups, casseroles, and stews. Mix it into pasta dishes. Bake them in the oven to make kale chips. Also, incorporate other cruciferous (brassica oleracea) vegetables like cabbage, broccoli, cauliflower, and Brussels sprouts into your diet. These vegetables are related to each other and are all rich in folic acid. The shorthand version is green leaf vegetables all contain folic acid, including rocket and other salad leaves! There is an increased risk of the foetus developing a serious birth defect, known as a neural tube defect, if the mother has a poor folic acid intake before and during pregnancy. The neural tube is a narrow channel that eventually forms the brain and spinal cord. Encephalocele – where a membrane or skin-covered sac containing part of the brain pushes out of a hole in the skull. VITAMIN C ~ Taking a high dose of Vitamin C could help shorten a cold if you take it at the first sign of symptoms. It could also cut your risk of the common cold in the first place. However, a good diet full of fresh fruit and vegetables is an excellent source of all the vitamins and trace elements we require. Most vitamin supplements will not give you the essential trace elements found in fresh fruit and vegetables or quickly frozen vegetables and fruit. Potatoes, scrubbed, and cooked in their jackets, are an excellent all year source of Vitamin C. Most of the Vitamin is just under the skin, so leaving the skins on gives one a maximum Vitamin C allowance. MAGNESIUM ~ Taking Magnesium daily helps to regulate your sleep patterns and is helpful in keeping mental well-being in balance. Any time of stress can cause some people to lose control of their sleep regime, starting to worry, and thus beginning a cycle of poor sleep. Start a Magnesium supplement now and and it will help in the coming weeks and, indeed, years. Prepared products containing mixes of various vitamins and supplements are usually expensive and do not contain sufficient of any of the ingredients listed to have a specific effective impact. A judicious selection of the basics would be much less expensive and have more impact. BANANAS ~ Using bananas as your snack of choice while having a break during study, marking, teaching, gives you a supply of trace elements not found in any other fruit or vegetable. They are very easy on the digestive tract, and if you add a dribble of honey now and then, between them they will keep your gut active and calm, and help reduce gastric upsets which are common at times of stress. Unripe, green, bananas have a higher starch content. As they ripen, the starch is converted to sugar (and the fruit becomes sweeter). Green bananas are also a good source of pectin, which is a type of dietary fibre found in fruits and helps them keep their structural form. Pectin breaks down when a banana becomes overripe, which causes the fruit to become softer. Bananas are loaded with valuable micro-nutrients, especially potassium. Potassium is one of the most important electrolytes in the body, helping to regulate heart function as well as fluid balance – a key factor in regulating blood pressure. The effectiveness of potassium-rich foods such as bananas, in lowering blood pressure and protecting against heart disease and strokes is well accepted and bolstered by considerable scientific evidence. Bananas are soothing to the gastrointestinal tract due to their high content of pectin – as soluble fibre that not only lowers cholesterol but normalises bowel function. The high fibre content of bananas promote satiety (feeling of fullness). However, as a tropical fruit bananas are higher in sugar and aren’t a great choice for diabetics. The resistant starch in bananas also has a pre-biotic effect, helping to keep gut bacteria happy by increasing the production of short chain fatty acids for digestive health. HERBS & OILS ~ Echinacea and Pelargonium herbs are both immunity super-boosters, and can help reduce the number of colds you get if you take them throughout the cold season. These are available in various sources from capsules to powders. Echinacea is a vital source of Omega 3, 6, and 9, especially for vegetarians and vegans, as it is plant derived, rather than the usual fish oil sources, and there is no after-taste of fish. However, halibut and cod liver oil capsules are excellent value, and easily available sources of Omegas. A regular fish element in your diet, two or three times a week, would give you all the Omega you require, and it is low in cholesterol. Tins of sardines in olive or sunflower oil can be kept in the larder for a good while, always available for breakfast on toast, lunch, or supper. Rich in Omega 3, this is a good value, quick and very handy food source, especially for those living alone, or working late. PLEASE consider where your fish is SOURCED. I would never buy fish taken from the Irish Sea, for example, as it is described as a 'sewer' by marine biologists, given its contributions from the nuclear power plant, Sellafield, in Britain, and the untreated sewage pumped out of Irish towns and cities along the coast. HUMIDITY ~ Normally, tiny hairs in your lungs waft germs and mucus into your throat, where you clear them by swallowing. But very cold air slows this movement, giving viruses longer to take hold in your lungs and cause an infection. VERY FEW schools will invest in humidifiers! Therefore, I suggest keeping containers of water (changing the water daily) beside every heater, radiator, or heat source, in your classroom (and at home). Keeping humidity levels between 40-60% using a humidifier reduces the period viruses survive in the air, and keeps your respiratory system warm and moist. Now, the system I suggest is clearly not so scientifically accurate, but it will help. Be careful that the water containers are safe from being knocked over, and should never be put near electric heat sources. YOU SHOULD CHECK FIRST to see if you are allowed to introduce such a humidifying system into your classroom. Even if disallowed in School, you could make your own for your home. PORRIDGE ~ Trinity College Dublin continues to come out with more good news on the benefits of porridge. We already know a bowl of porridge for breakfast reduces random, unhealthy, snacking, it fills one until lunchtime; it is very good for the skin; and now we hear that the active parts of the oatmeal work to breakdown cholesterol build-up, and plague build-up in blood vessels. It assists in weight loss; and of course it is a very good value food ~ considerably better for us than the processed breakfast cereals claiming to contain seeds and fruit which are hugely more expensive, with their frequently added sugar / sugar-types and salt. We can add our own, in season, fresh fruit, as we like! For example, LINSEED (flaxseed) CANNOT be digested by the human system as the coating is too dense for our digestive juices. Also, bought milled linseed is of little value, except maybe as a very expensive contribution to roughage consumption. Linseed is very rich in Omega, and should be milled as needed, as it loses its nutritional value within twenty minutes of milling. https://www.bbcgoodfood.com/howto/guide/health-benefits-bananas; the Holland & Barrett website; plus advice from a Local Authority Dietitian regarding stress management, and continuous reading of up-to-date research. I hope you have had an opportunity to start working in your classroom before the first day of the new scholastic year, if possible, making sure you have already investigated and learnt how to use the software system used by your School for uploading students’ grades and report cards. PERHAPS, you did it while you are setting up your classroom before the start of term. If you have not had the chance to work on the system before the start of term, it would be very worthwhile working outside school hours for a few mornings or evenings, whichever suits your life better, until you have your system up and running to your satisfaction. When you have learnt how to input information in your School's database, you can then design your own student data sheets based on the database requirements, and to suit your own way of working, so that you mark their work, including space for comments on effort made, co-operation, difficulties, improvements, and your general observations, etc. YOU NEED to develop a weekly database update system, which you can always access. There is frequently a scramble at the end of term, and at year end, amongst teachers trying to get time to input their work onto the School's database. FREQUENTLY, teachers spend four to six full weekends inputting their data, before the end date in June, or whenever your year end takes place. I am sure there is a conversation in every school at the beginning of every year, along the lines of "we'll be more organised this year". However, getting teachers, without coinciding free periods, available to discuss fair access to the School's database, seems elusive, despite best hopes. SET UP YOUR OWN, personal, notation system on the School's database as soon as possible, starting by inputting basic information on your students. You should try to update your inputs, in any spare half hour before the school day starts, as frequently as is necessary, in the school week. INCLUDE from the beginning, updating as you go, all the contact details for the parents / carers / family members, for each child. Some education authorities require quite detailed and frequently supplied information on each student, which may also be required to be produced at P/T meetings. If your School doesn't supply its own system for keeping track, I suggest you design your own tick box form, listing: (i) the marked improved efforts in named activities and subjects; (ii) the usual types of specific misbehaviour, especially if it has a negative effect on classmates: (iii) possible learning difficulties observed that require investigation; and any other ideas that may suit your particular class. Leave room for extra comments, and head the form with space for the name of the student, and the date and time of the observation. This form could take a great deal of pressure off you, as you would not be under the stress of trying to recall specific incidents to illustrate a possibly important event or condition. It will help cover your back. MAKE SURE you know from the very beginning of the year, if ANY student(s) has allergies, asthma, or any other medical conditions. Also try to discover if a child(ren) has / have any learning difficulties or special needs as early as possible, so that you can arrange the child's / children's place(s) in the classroom, to give them the best possible access to activities, and the quickest and easiest route to the lavatory. SPEAK WITH your Special Needs Assistant as soon as possible to arrange support for you and your student(s). Regarding children with Special Needs, it would be very helpful for all to arrange meetings with the students' PGCs, including the Special Needs Assistant(s) and any Special Needs Teacher(s) the School has on its staff, who would be of help, and will involved with these students during their school year, helping to manage their needs. Early input from PGCs is vital to the proper care of these children. Sometimes the information flow doesn't work, and someone thinks someone else is informing the staff who need to know about particular children in each class. It's always best to CHECK FOR YOURSELF that you are fully informed. If the PGCs feel that you are PROACTIVE in providing the best educational experience for their children, they will be much more forthcoming about what, in their experience, works and does not work. They shall become a support to you. IF YOU ARE ON TOP of inputting your grading and report card information, you have reduced a great deal of potential stress which plagues many teachers daily, all year. ALSO, it will help you avoid being caught on the hop by a query from a PGC. Crocosmia hiding behind brightly variagated shrubbery. Nature can play with colour as she chooses. Depending on your School's rule about the degree of PGC access to teachers to discuss students, try not to get caught out. MAKE SURE you understand fully the Rules about how available you are expected to be. If a PGC turns up to a collect a child at the end of the school day and then tells you he / she wishes to discuss what appears to be the child's difficulty in class. Tell the PGC, or whomever, that you will be happy to discuss the matter, and take out your appointment book immediately. Say you would be pleased to arrange a mutually convenient appointment (only if the enquirer is listed as one who is entitled to discuss a child), of 15 minutes duration, and that you will take an email address or mobile / cell number, to which you will send some suggested dates and times. Do not agree to meet anywhere but at the School, and for 15 minutes duration only (unless the situation turns out to be very serious, in which case you should conclude the meeting promptly, saying you, or a School representative, will get back to the parent / carer as soon as possible. IMMEDIATELY, you must involve the School Management, and any other appropriate staff member(s), before any further meeting with the PGC). Some matters of School or Department of Education policy, and possibly including insurance cover, may be involved in his or her concerns, and the issue should be left to be dealt with by the appropriate people. If the PGC contacts you in the meantime, have an appropriate phrase to hand, approved by the School Management on legal advice, to let him / her know the concern is not being ignored, but is being dealt with at an appropriate level. You have to make sure you do not get stuck in the middle of anything. Your inclination may be to say something helpful and consoling, but you must curb this urge, and stick with the 'party line'. Meetings with PGCs should only be held at the beginning or end of the school day, only in the School, and only when you are comfortable you have all your information on the particular student to hand, and feel prepared. A certain amount of flexibility is reasonable, but you cannot be expected to hang around at the School at 5.30pm, 6.00pm, 7.00pm, or whenever the PGC arrives from work. An appointment is an appointment, and you are a professional. Having given some leeway in case of bad traffic conditions, and trying to contact the PGC by mobile, if you cannot get a clear undertaking from him or her to arrive within a short period of time, go home! If the 'problem' turns out to be 'another student', be very swift to say you will listen fully but "You cannot and will not discuss another student with anyone but his / her parent(s), carer, or guardian(s)". At the very beginning of the year, it is an extremely useful exercise, to announce to your class that you will ALL be having discussions during the first weeks of term. You and your students shall be listing on the board what is the kind of behaviour everyone would like to experience in the classroom, playground, and anywhere else connected with your School and, equally, what behaviour would be unacceptable. Very young children are perfectly well able to understand what is fair and unfair; and they know how to say what they do and do not like. Students do not see these posters on classroom walls all over the World. However, if through a broad-based discussion in the classroom, encouraging everyone to take part, ensuring to ask EACH student to offer both a positive and a negative type of behaviour, and after a generally agreed trimming of the lists, a consensus will be reached. Your students will have been integrally engaged in the development of the 'Rules of Behaviour' for their class. These are their ‘Rules’, and therefore the students will be self-regulating to a much greater degree, and also pointing out if someone is being mistreated out of sight of you, the teacher. The teacher has to make it clear to all the children that she is available for a quiet chat, if any child has something he or she needs to talk about. You can chat during yard break when the rest of the class is outside. If you are on yard duty, and think the child seems very upset, beg a colleague to swap duty days. If a child is behaving in an unusual fashion for him or her, the teacher should be able to call the child to a quieter place where they can talk comfortably. The child can be asked gently if there is something going on that the teacher doesn't know about. Ask if the child has been upset or hurt. Every child in a class has to know, the teacher is there to help him or her however she can, and she wants to be told about any problems, so that she can help. Because these are in the 'Rules', every child can be comforted that he / she is entitled to respect, consideration, fairness and courtesy. The whole process of developing the 'Rules of Behaviour' has two extra and significant benefits. Firstly, as you listen to the ideas from your collected students, you will get a very good insight into the various personalities in your class, which will prove a very helpful start to the year. Secondly, the students, through working together to formulate their 'Rules', arguing for their own ideas, and learning how to compromise, will also get to know each other, and will have learnt about give and take. They will feel, at the end of the process, that this is their class, and they have been shown consideration and respect by you, the teacher, and by their fellow-students. On cold, especially wet, mornings, consider introducing a mini Body Check, first thing. You can get some circulation going in the feet and hands, and make the children feel warmer and more comfortable, ready for the day. Ask the children to go to their tables, sit down, and take off shoes and socks: some students may need help with this. Have everyone take off socks saying it enables better 'wiggling of toes'. Place a couple of tissues onto each child's place on the tables, and as you pass around the room, check on socks discreetly. Tell the children the tissues are for using on their feet before and / or after their session, and always to ask for more if needed. Carry on with HERE WE GO! from points 2 to 7 for feet, and 9 for hands and wrists, detailed below, under the heading WHEN EVERYONE NEEDS CALMING DOWN! Please see the last Section of this Post WHEN EVERYONE NEEDS CALMING DOWN! for those days when nothing else will work! Even quite young children are capable of taking on responsibilities in the classroom. THEY ENJOY having a job, and usually take pride in the work. NATURE TABLE ~ Give every student a week in rotation, as Monitor for the Nature Table, repeating when required as the year passes. This job would include changing the water in a vase of flowers daily (keep vases and pots small and / or low), using only water that has reached room temperature for flowers and pot plants ~ not straight from the cold tap. 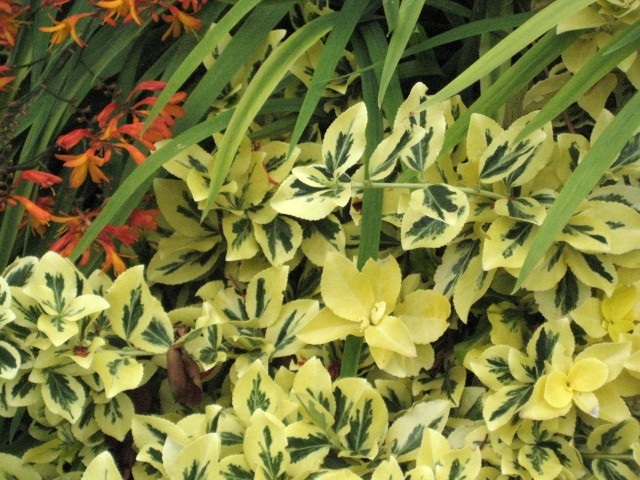 Pot plants should be watered only when they appear to be nearly dried out. The Monitor shall require instruction in the care of pot plants. The Monitor will brush down the surface of the Table daily, removing dead leaves, to keep it clean. Encourage all the children to bring in pieces for the Table, encouraging oddities and items other than the usual dried leaves, sea shells, and blossoms from the garden. Consider having a colour theme for the Nature Table, giving the children a couple of weeks' notice in which to collect their material ~ it's extraordinary what can turn up! If a child has a story behind his or her contribution, encourage the telling of the story, while the object is passed around the class, if it is not too fragile. Keep pushing the boundaries of what should be on the Nature Table. Offerings for display from students will be given to the teacher in the first instance, but the Monitor should choose the arrangement of the display of the material on the Nature Table for his / her week. Take a photograph of the Nature Table every Friday, noting the name of the student who was Monitor and who looked after it for that week. This photograph SHOULD BE part of each STUDENT'S PERSONAL FILE. CLASS LIBRARY ~ Depending on the age range of your class, give every student a week in rotation, as Monitor for the Class Library. He or she will be responsible for making sure all books are put back correctly on the shelves by the end of the day. You, the teacher, should announce to the class that collection of Class Library books will take place in 10 minutes. That should give students time to finish a sentence and make a note of the page they are reading, so that they can continue during the next Library Period. The Class Library Monitor shall need clear and detailed instructions on how to replace books correctly on the shelves, and will have to understand the system used to display books ie, alphabetically by author, or divided in sections of interest, or divided into ease of reading sections. The Monitor should be given sufficient time to fulfil his or her job, therefore Library Period should be held in the early afternoon, at the latest. Always let the Monitor know, from the beginning, he or she should ask for help immediately, any time he or she feels under pressure to get the job done in time. NO-ONE IS LEFT OUT IN THIS CLASS! TIDY CLASSROOM ~ The students should learn, from the first week of the first term, they shall be expected to keep their desks tidy and the space around their desks clear. They need to know that having schoolbags, rucksacks, satchels, coats, pullovers, sports gear, etc, on the floor is a Health and Safety Issue. If the alarm bell rings, the students are expected to leave the classroom immediately and calmly, so there cannot be obstacles on the floor which might trip them up. TAKING CARE OF YOUNGER STUDENTS' POSSESSIONS ~ You will need to spend time, as early as possible at the beginning of the school year, arranging for coat hooks with name tags, at heights suitable for each child, where they can keep their outdoor wear, shoe bags, sports bags, etc, depending on the School rules. Get your students involved in the design of their name tags. Some may not be able to write their names yet, but if they colour and design their name tags after you have printed their names, it will assist all students identify their own coat hooks. If bags for outdoor footwear are required by the School, ensure all your students have their names very clearly marked on their bags. Likewise, if your School offers a locker for each student, encourage your students to make colourful stickers of their names and other decorations, having printed the names for those who cannot yet write their names, and thus make it easier for them to locate their lockers. Having a sink in your classroom expands greatly the activities you could carry out with your students. Also, after Artwork sessions, students should be responsible for cleaning and drying off their desks; washing paint brushes used; and the plastic jars which contained water for rinsing the brushes, and then putting away all the Artwork material in its proper place. It should be relatively easy to organise the washing and drying, one desk or table at a time. However, if you do not have a sink, you may have to schedule your Artwork sessions around the attendance of a Classroom Assistant. Classroom Assistants can be in short supply. At the earliest possible opportunity of the new school year, try to book the availability of a Classroom Assistant as frequently as possible. Having an Assistant in the classroom will broaden greatly the number of projects you can undertake with your students. Some of the more mature and able students may be suitable to be nominated as Artwork Monitors, for some of the easier cleaning jobs. CLASS BINS ~ Teach the children, from the youngest classes, about the recycling bin, the food & liquids bin, the tins / cans / bottles bin, and any other bins in the classroom, from day one. Make sure the children take responsibility for their own material, and dispose of it correctly. After a short period, they will be doing these jobs automatically. Give every student a week in rotation, as Monitor for the Bins. He or she will be responsible for checking how full the bins are, and for informing the teacher that one or more bins need to be emptied. This job will require instruction on Health and Safety issues, and the use of rubber gloves which each student shall wash with detergent containing anti-bacterial and disinfectant before and after the job of looking in the Bins. Again, first check the School's Rules on students taking part in these latter activities. FOOD AND LIQUID BINS ~ must be emptied, washed, and sterilized daily. Find out whose job that is also, it is a Health and Safety Issue. Judging by nationwide radio programmes, it appears that many adults put utterly inappropriate and offensive material in their green bins (recycling bins), and that incorrect material is put in the brown (composting material bins) and grey bins (bins for landfill or combustion material). The fact of misuse of the bins came as no surprize, but the public was shocked to hear dirty disposable nappies were to be found in amongst washed yoghurt cartons, cardboard, newspapers, and magazines in the green recycling bins. Young children would love the job of instructing on the appropriate material for the bins at home. Having learnt the information, and then carried out the job of monitoring the Class bins, they could bring their knowledge and experience home. They may not be able to manage the size and quantity of material to be put in the bins, but they could supervise the work. They would love this responsible and important job! There is also a possibility they could drive the rest of their family bonkers! The children should be asked to produce POSTERS, specific to a particular bin, once you are happy all the students understand the rules regarding what material goes in which bin. These posters will help reinforce the information gained, and will also be part of their 'Artwork', 'Social Studies', 'Environmental Studies'. POSTERS should be displayed in the classroom initially, and later kept filed for display at Parent Teacher Meetings, and for inclusion in EACH STUDENT'S PERSONAL FOLDER. Depending on the set-up of your classroom, and the services provided in the School, you may wish to establish other monitor positions, for the well-organised running of your classroom, and the development of responsibility in the students. You may have noticed, that apart from giving students useful jobs, which will help them develop independence, responsibility, self-reliance, self-confidence, and self-esteem, having monitors for various jobs will mean you should be spending a good deal less time at the end of every day, tidying up! Some days are just like that! Is it because the sun has come out? Because it's Friday? Or it's just that everyone in the classroom is jumpy, giddy, not able to concentrate ~ and that includes the teacher! There is no point in fighting it. Children will get fed up, and anyway it totally contagious! Have some calming music at hand in the classroom at all times. Please do NOT bring in one of those recordings of gently falling water, or the whole class will be heading for the lavatory. How about some very laid back Reggae, or some smooth and easy Jazz, or some John Field Nocturnes? Whatever you have, whatever you like, that you can bear hearing repeatedly, that is calming and relaxing with a groove, and the children don't give out about. Mix the music up frequently. You'll need some back-up selections, in case of rioting on grounds of taste! Turn on the music quite loud for a short period, to get the attention of all the class, and then lower the volume sufficiently to be heard, when telling them what's happening next. SAFETY IS YOUR PRIMARY AIM. You will need to wander around the classroom continually for the duration of the BODY CHECK to make sure everyone is taking it easy, and no-one is straining too hard. If a child loses the pace, just gently ease him or her back with the rhythm. (FYI ~ You will be carrying out a Mindfulness Body Check! These usually last from the toes to the top of the head. However, if you have very young students, leave out some of the exercises because they would lose interest / concentration if you tried a full Body Check. ON COLD, AND ESPECIALLY WET MORNINGS, consider introducing a mini Body Check first thing, you can get some circulation going in the feet and hands, and make the children feel warmer and more comfortable. Also, if you sense that the Body Check has calmed everyone down, and you want to get on with work, you can end it at any time. I think you should let the class know you will be doing more of this again. Please don't call them exercises, or a Body Check. You want the students to feel the music, and become aware of their bodies in a relaxed way. Naming something can sometimes build a barrier. The class will probably come up with its own name anyway, go with that! Be clear with the students ~ this is NOT a competition, so please don't try too hard. Say the reason the children keep their eyes closed is to help them concentrate on the music and your voice, so that they REALLY experience all the movements fully. 3. Tell the class who the musicians are, and the type of music they are playing, and then say: "Close your eyes, listen to the music, breathe in and out gently, and listen to my voice". 11. This exercise would usually involve rotating the head very gently on the neck, and slowly lowering it towards one shoulder and then the other, then down with the chin, and slowly backwards with the head. It's a marvellous exercise, but I would not include it in a Body Scan unless you know your students very well, bearing in mind some may have physical disabilities, brittle bones, or are just very awkward, as they are still growing, and so keep falling over themselves in the playground. A strained neck is painful. I'd really steer clear of this one, with students, unless you are totally confident or working with older students who are sufficiently mature. Maybe, just keep it for yourself as part of your unwinding after a long day! If you see any errors, typographical or factual, or if you disagree with any of my ideas, I should be very glad to hear from you. Please let me know what you think of my ideas ~ if you don't tell me, I won't know if I've gone wrong somewhere! I am an elected Member of The Tutors' Association. All my Posts originate in my website, www.icobrien.com, "Education Matters". They are developed, updated, and continually revised. Vaccines are among the greatest inventions in the history of medicine. They have saved countless lives and reduced human suffering by an amount which is impossible to calculate. However, today there are many rumours and concerns going around about the safety and effectiveness of vaccinations, which have caused many people to reject them. Here, we will consider their questions and answer them as we can. Mercury is dangerous! And it's in the vaccines! Firstly, that's not quite true: the only thing in the vaccines was Thimerosal, which is not the same as the dangerous mercury you are thinking of. Secondly, the FDA called for (and achieved) the removal of that substance from all vaccines other than the flu shot back in 2001. And if you like your vaccinations like you like your Jamba Juice (i.e. — a la carte), doses without Thimerosal are available if you are really a stickler for it. If I quote a person, group, organisation, or establishment, I do my very best to source the material quoted, and to attribute it properly. If I cannot satisfy myself I have found the author or speaker who voiced a quote, I resist using it, no matter how tasty a bite! If I refer in passing to views expressed by others, I attribute the views even if they have not been given verbatim in the text. I work on a basis of goodwill and good intentions. I shall make errors, being human, and when I do, I apologise now, and should always welcome a correction, which I would insert in the relevant Post prominently, in clear unambiguous text and type, repeating the apology. That's is the best I can do! "SimpleSite is the easiest way to make your own website. Changing design and adding content, including your own photos, is very easy. Updating or adding Posts is very simple. I did it!